Learn How to Play the Piano or Improve Your Piano Skills with Hypnotherapy! Always wanted to learn how to play an instrument? Think you could do with some effective help in improving your skills? Discover or enhance your natural ability to play the piano — amaze family and friends – and most of all, yourself! Steve G. Jones takes you to the next level with the Playing Piano Hypnosis MP3, and helps you discover the musical genius within you!It’s easier than you think. You’ll see a new you and you’ll feel great about it!!! Steve G. Jones, Ed.D., Clinical Hypnotherapist, charges $1,500 for a custom recording and $25,000 for a one-hour private hypnotherapy session at his office. But you can get all the benefits for this low price. 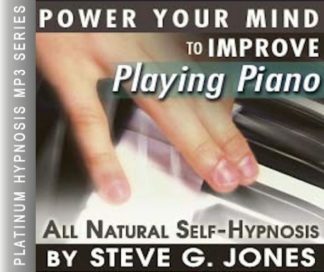 Simply listen to the Playing Piano Hypnosis MP3 session every night as you go to bed for three weeks and feel the changes happening in your life. You will feel more empowered, more in touch with your true self, and you will truly know that your goals are within your reach. Steve G. Jones achieves AMAZING and LASTING results!!! Hypnosis is the easiest way to affect change in your life because the positive messages go straight to your subconscious mind effortlessly so you can accomplish your goals and reach for the stars!! All you have to do is listen to the Playing Piano Hypnosis MP3 download at night as you go to sleep!!! You’ll hear soft music, the gentle sounds of the beach, and the soothing sound of Steve G. Jones’ voice all working together to bring about positive changes in your life easily and naturally. Steve G. Jones has been helping people improve their lives with hypnosis for over 17 years…now it’s time for him to help YOU… don’t wait, do it NOW !!! you’ll be glad you did. See you at the top! And now as you continue relaxing deeper, deeper, and more deeply relaxed, I would like you to imagine yourself sitting in front of a piano. And as you breathe in deeply now through your nose, you breathe in a sense of calm confidence and as you exhale very slowly now through your mouth, you let go of any fear, any concern. Breathing in deeply now again through your nose as you sit in front of your piano. Breathing in confidence and serenity. Exhaling now through your mouth letting go of fear, letting it go. And you continue breathing easily, effortlessly, and comfortably. Relaxed, at ease and now you imagine yourself beginning to play the piano, that’s right. Your fingers move easily. Your posture is perfect, that’s right. You have a perfect recollection of everything you have learned about playing the piano and you feel a sense of inspiration and perhaps you begin to improvise a little. As you play and relax and perhaps you begin to improvise even more now because you are confident in your ability to play. Whether you are simply reading the music and playing what is on the sheet or improvising or both, you are relaxed, confident, willing to take risks, willing to grow, willing to learn. And because you are willing to learn, your memory responds positively. You are able to learn and remember many things. You realize just how powerful your memory is. Your memory has an unlimited capacity. Your memory is far more powerful than even the most powerful computer will ever be, because your memory has unlimited storage capacity, unlimited storage capacity. And as you continue to learn more and more about the piano, you will be inspired by your studies and you will also have an instant recall of everything you have learned at any moment. This means that while you are playing the piano, you will remember every lesson you have ever received, every instruction and this will help you in a positive way. Any negative emotions that you have associated with the piano, let them go, let them go now, release them forever. Because you look at piano as a wonderful experience offering you so many opportunities, playing piano, learning about the piano, improvising while playing the piano. Piano, opens for you, a world of opportunity. If you choose to study to the point of being a concert pianist, you realize that you will be able to do so because you follow through, you stick to things. You are determined to learn. You are a powerful, wonderful, amazing person. And I applaud you as if I were watching you play. I applaud your efforts. I applaud your desire to learn more. I applaud you. You are an amazing pianist. Your piano playing abilities are improving day by day. Your ability to learn information and apply it to the piano, that ability is improving day by day so that you will be able to learn more quickly and apply what you have learned and see the relationships between what you already know and what you are currently learning because you are an amazing piano player, amazing student of piano and I applaud this. So relax and realize just how wonderful you are. Playing the piano is a skill that takes time and patience no matter what your playing ability is. This powerful hypnosis program will allow you to explore your natural ability for playing the piano and improve easily and effortlessly. The Playing Piano Hypnosis MP3 recording will heighten your ability to learn new things in regard to playing the piano. It will allow you to take more in during practice and lessons. This hypnosis program will help you improve your concentration and focus on the music and the piano. This program will not only improve your ability, but this hypnotherapy session will build your confidence. You will gain a lot of confidence in your ability to play the piano by listening to this recording for 21 nights in a row before going to bed. During the session you will receive powerful and positive suggestions. You will be able to visualize yourself playing the piano easily and to the best of your ability!